Ich kann diese Urlaubsregion nur wärmstens empfehlen und würde auch selber jederzeit wieder dorthin reisen. "This spectacular new trail is Europe’s best-kept trekking secret. Go and enjoy it before everyone else does!" He has given talks to over 1,000 audiences in five countries, and holds the Royal Geographical Society (with IBG)’s Ness Award for popularising geography and the wider understanding of the world. “I really didn't know what to expect on our hiking trip through Montenegro, Albania and Kosovo last fall but now I know what I'll never forget: Hiking into Thethi, a tiny alpine village in northern Albania. It'd taken us a bit longer than we'd planned to cross over the mountains but it was well worth the effort. Upon arriving in the village, I had the feeling that Thethi was one of those mountain communities doomed to die out as the youth move away from their traditions to find opportunity 2.0. So what a relief to see all the new guesthouses popping up and a new (hopefully sustainable) economy evolving in such a gorgeous setting. “Great trail – well marked, with very welcome “klupis” (a sort of informal, family-run drinks station, which were no more than a shady platform) at strategic points along the way – at least one on every day’s hike – where cool (-ish!) drinks could be bought and tired feet rested under thatched “umbrella” shades. The homestays were comfortable, the food fresh, local, home-cooked and plentiful, as was the rakija… just the job at the end of each day for a tired body and a hungry soul to kick back in great company. Somehow, even though we couldn’t speak the language, our hosts seemed to be right on top of arrangements and made us feel as if we were part of the family. The highlights for me were: the home-cooked food; the characterful homestay houses/farmhouses; the friendly hospitable local people; the stunning wild scenery; and the crazy company at the end of each day’s hike – a real taste and privileged insight into rural Albania…It is all very local, natural, “of the place” in a way that is fast disappearing throughout Europe today. den Restaurants. Auch unser Reiseleiter Egmont, der wahrlich schon viel gesehen hat von der Welt, war begeistert - und kommt in diesem Jahr wieder!" “There is a place in the world where free the mind from everyday worries and find yourself walking into your intimate human being side by side with wild nature, discretely observing marvellous alpine landscapes and meeting simple and warm people? 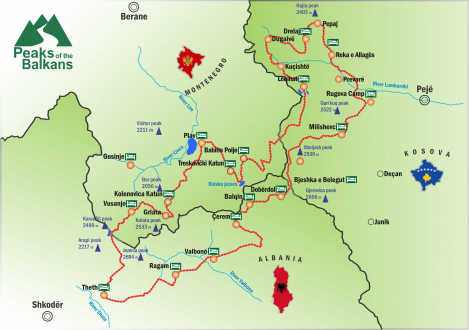 Als Begleitung einer Pressereise im Juni 2014, die wir für Journalisten organisiert haben, durfte ich einen Teil des Peaks of the Balkans Trail kennenlernen. Ich war tief beeindruckt von der Schönheit und Ursprünglichkeit dieser rauhen, unberührten Berglandschaft. In der ganzen Woche haben wir nur drei Wanderer getroffen! Einsame Pfade führen hinauf zu spektaluräen Gipfeln, Wiesen voller tiefblauer Enziane und wunderschöne kristallklare Bergseen wechseln sich ab. Ich war auch sehr berührt von der Gastfreundschaft der Menschen. Mit einfachsten Mitteln und regionalen Produkten bereiten Sie schmackhafte Gerichte zu und in ihren teilweise einfachen Unterkünften haben wir uns sehr wohl und Willkommen gefühlt.